Michelle brought Scruffy, her Toy Poodle, to CPT after he failed 2 Happy Tails evaluations due to compulsive nonaggressive vocal reactivity (barking and whining) amidst unfamiliar dogs. To address the problem, in a pristine environment we began employing a variety of impulse control protocols that encouraged Scruffy to remain calm, quiet, and attentive. We then introduced a volunteer dog to the environment. Using a clicker, intermittent food rewards, and several systematic desensitization drills that encompassed multiple spatial and motion perspectives in which Scruffy may encounter a dog, we gradually taught Scruffy vocal inhibitory control. In simple terms, Scruffy learned that “slow is fast- and fast is slow.” We educated Scruffy that quiet behavior is more fortuitous than barking or whining and that he will more quickly achieve contact with the other animal if he remains composed, rather than exhibits excitable or demanding vocal behavior. 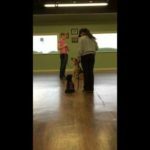 The video below shows Scruffy moving toward the volunteer dog (Gromit- handled by CPT Trainer Meghan Markham). The CPT Single Stationary Drill, with the volunteer stationary is often the easiest of the CPT Reactivity Drills. To see further videos, please review the CPT Facebook Page. There are a series of 4 videos posted on January 27, 2015. The “Scruffy Series” encompasses a number of spatial perspectives in which Scruffy may encounter dogs in practical situations, with relevant cognitive desensitization drills specific to each situation. The second video (available only on Facebook) shows the CPT Single Stationary- Subject Stationary Drill. Movement by a volunteer toward the subject’s territory is generally more challenging. The third video shows the CPT Circling Drill- Handler Adjacent (available only on Facebook), where the volunteer circles in rapid motion about Scruffy. Scruffy remains stationary, calm, attentive, and quiet throughout the drill. The fourth and final video (available only on Facebook) in the Scruffy series examines whether our behavior modification goals occur in the absence of the clicker and food. To maximize the difficulty level, in this drill, the CPT Circling Drill- Dog Adjacent, we have Gromit circle Scruffy without a human buffer, meaning Meaghan is to the outside and Gromit is to the inside of the circle. Yet, Scruffy remained stationary, calm, and attentive and he remained quiet other than for one very brief whine. Michelle’s complete behavior modification plan includes laboratory-style and spontaneous drill homework, proactive stimulation, several lifestyle impulse control drills, and management changes. If Scruffy performs as he did at CPT, after just a few weeks of homework we expect that Scruffy will pass his next Happy Tails test with flying colors.